Blu-ray, DVD and Digital Download include bonus content featuring interviews with the all-star cast! Burbank, CA, June 2, 2014– The secrets to building super intelligence emerge in “Transcendence,” arriving onto Blu-ray Combo Pack, DVD and Digital HD on July 22 from Warner Bros. Home Entertainment. “Transcendence” stars Oscar® nominee Johnny Depp (“Pirates of the Caribbean” series) as a researcher whose quest to create an all-knowing and all-feeling machine threatens to destroy mankind. “Transcendence” marks the feature film directorial debut of Oscar®-winning cinematographer Wally Pfister (“Inception”) and stars Paul Bettany (“The Da Vinci Code”), Rebecca Hall (“Iron Man 3”), Kate Mara (“House of Cards”), Cillian Murphy (“Inception”), Clifton Collins, Jr. (“Pacific Rim”) and Oscar® winner Morgan Freeman (“The LEGO Movie”). Adapted from a screenplay by Jack Paglen, “Transcendence” was produced by Oscar® nominees Andrew A. Kosove and Broderick Johnson (“The Blind Side”), alongside Kate Cohen, Marisa Polvino, Annie Marter, David Valdes and Aaron Ryder. 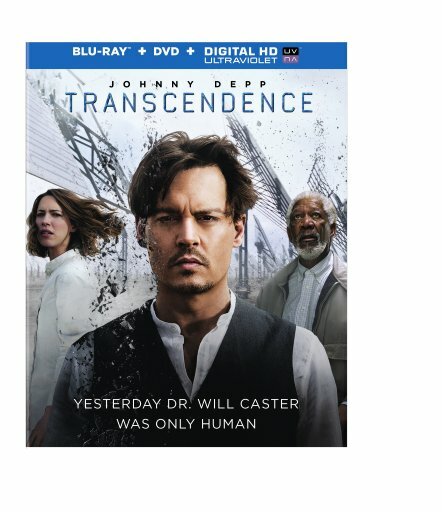 “Transcendence” will be available on Blu-ray Combo Pack for $35.99 and includes the film in high definition on Blu-ray disc, a DVD, and a digital version of the movie in Digital HD with UltraViolet. Fans can also own “Transcendence” via purchase from digital retailers. In “Transcendence,” Dr. Will Caster (Johnny Depp) is the foremost researcher in the field of artificial intelligence, working to create a sentient machine that combines the collective intelligence of everything ever known with the full range of human emotions. His highly controversial experiments have made him famous, but they have also made him the prime target of anti-technology extremists who will do whatever it takes to stop him. On July 22, “Transcendence” will be available for streaming and download to watch anywhere in high definition and standard definition on their favorite devices from select digital retailers including Amazon, CinemaNow, Flixster, iTunes, PlayStation, Target Ticket, Vudu, Xbox and others. “Transcendence” will also be available digitally on Video On Demand services from cable and satellite providers, and on select gaming consoles. Posted in Featured, News, Press Releases, Warner Bros.Tagged Cillian Murphy, Johnny Depp, Kate Mara, Morgan Freeman, Paul Bettany, Rebecca Hall, Transcendence, Wally Pfister, Warner Bros.